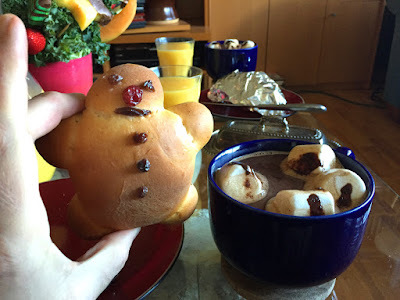 Several Times Removed: Nisu Paappas for Christmas! In 1988 I spent my first Christmas away from my family, having been invited to spend the holidays with my new boyfriend and his family in northern California. I was very nervous but it was a very fun Christmas, I felt very accepted, and it ended with a spectacular hot-air balloon ride on the morning after Christmas. But one aspect of that holiday visit has really stuck with me and that was my love for the Finnish holiday bread Nisu. I have made it every year since. Eric's mom is of Finnish descent and this recipe came from her mom as I understand it. The bread has a lovely texture, quite unique in fact. Its both dense and light at the same time and has a lot of cardamom in it. It's wonderful as is, but also makes great toast that is extremely crispy on the outside, yet pull-apart tender inside. As far as that goes, if you have any leftovers it makes superb French Toast, too! How do you make the stuff, you ask? Like so! In a large bowl dissolve the yeast in milk. The original recipe asks that the milk be scalded, a process no longer required given our pasteurized milk. However I usually do heat the milk to tepid to give the yeast a head start. Just make sure it's only warm and not hot. You don't want to kill the yeast! Add and mix in the sugar, salt, cardamom, and four cups of the flour. Beat in the eggs, one at a time. Quickly knead in the remaining flour, enough to make an easy-to-handle dough that isn't sticking to the board or your fingers. Now while you finish kneading the dough, work in the softened butter a little at a time. Cover and set dough in a warm place to rise until doubled in size. Punch down the risen dough. Divide the dough into three equal parts. Working with one of those parts, divide it into three equal parts, too, and form each into long lengths to be braided together to form one loaf. 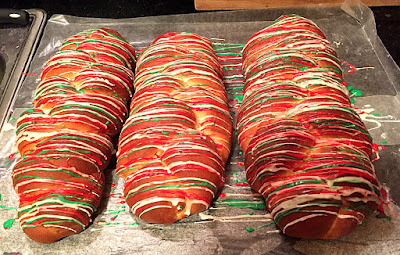 Repeat process with other two large masses of dough until you have three braided loaves. Place on one or two large baking sheets (depending on lengths of loaves) and let rise again until doubled in size. Preheat oven to 350 degrees and bake loaves for 25 to 30 minutes until a lovely brown. You can bake in two batches if needed. An extra 25 minutes of rise won't hurt the second batch while batch one is baking. Once the loaves are cool, drizzle with Confectioner's Icing: One tablespoon of milk and a 1/4 teaspoon of vanilla extract mixed with a cup of powdered sugar should do the trick. 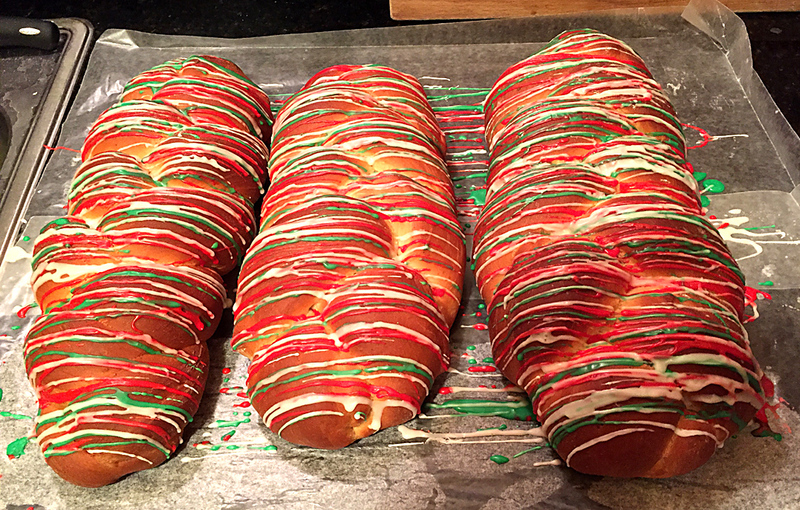 This year I split the icing in thirds and made red, green, and white icings to drizzle on the loaves. Now, there is another part of this holiday tradition. For Christmas morning, Eric's mom would always make a Nisu Paappa each for Eric and his sister (and one for me, too, when I joined the family). Pappaa means grandfather in Finnish and it is pronounced "Boppa." A Paappa is formed by making a large ball (perhaps the size of a small apple) and adding arms, legs, and a head, a bit smaller than ping-pong balls. Use a wet finger to help cement the pieces together or gently pinch dough on the bottom edge for a little extra security. These little fellow will bake faster than full loaves, perhaps twenty minutes, so watch them. When cool, you can decorate them - using raisins for buttons and eyes, a red-hot for a nose, a frosting belt, etc. Just have fun! IMHO, they are best eaten around the Christmas Tree while opening gifts on Christmas morning! With some hot chocolate and fresh orange juice.